I enjoy using my compassion, skills, and expertise to help my patients achieve an active and healthy lifestyle. Dr. Yi is fellowship trained and board certified by the American Board of Orthopaedic Surgery. He is a member of the American Academy of Orthopaedic Surgeons and the American Orthopaedic Society for Sports Medicine. He firmly believes in non-surgical treatments and that non-operative methods are successful in most cases. However, if surgery is required, Dr. Yi can perform the latest, most advanced minimally invasive arthroscopic surgeries available. His fellowship training was in sports medicine and his expertise is in shoulder, hip and knee surgery. He is one of the few surgeons trained in hip arthroscopy that preserves the hip joint using small incisions instead of the traditional large incisions that require longer recovery times. His training also includes the use of ultrasound for diagnosis and treatment, including ultrasound-guided hip injections. 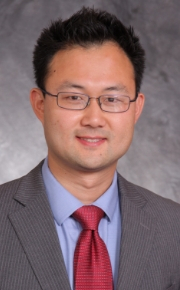 Dr. Yi has presented his research nationally and has authored various book chapters in sports medicine. During his training, he gained experience in the treatment of collegiate and professional athletes, assisting with team physicians for the Chicago Bears, Chicago Fire, and the Chinese Olympic Volleyball Team. Dr. Yi was born in Jeju, South Korea but grew up in St. Petersburg, Florida. He obtained his undergraduate degree in biology from Emory University and earned his Doctor of Medicine from Drexel University College of Medicine before completing his residency in orthopaedic surgery at Northeast Ohio Medical University. He then completed additional fellowship training in Orthopaedic Surgery Sports Medicine at the University of Chicago, where he trained in advanced, minimally invasive arthroscopic and open techniques. Dr. Yi enjoys spending time with his wife and three sons. He also likes to fish, hike, and play soccer and volleyball. Incredible. He was fast, super knowledgeable and fun to talk to. Perfect experience from start to finish. I’ll be having all of my friends and family visit him if needed. One of the best! My experience with Dr. Yi was excellent. I had pain in my knee for a while. I found Dr. Yi based on reviews, qualifications and his patient care philosophy. He looked at my x-rays and felt the knee indicated torn ligaments and arthritis, which was news to me. He drained the knee and injected cortisone which helped immediately. After three weeks at a follow-up appointment, my knee is doing much better. If it acts up again, I told him that I would be back! Great experience with Dr. Yi! He drained my knee and it felt 100 percent better. I felt little to no pain during the procedure. I feel very fortunate to have had Dr. Yi as my surgeon and follow-up physician. I would not hesitate to recommend him. Dr. Yi was very professional and easy to talk to and performed the injections in a caring manner to make me comfortable with the procedure. This is the second year I’ve dealt with him and if there had been anything that concerned me I would have changed doctors. I also appreciate the efforts of any of the staff that helped me with the paperwork for the handicap permit. They processed the paperwork in a very timely manner and explained how to finish the process. Dr. Yi and his assistant Shay are both amazing. They listened as well as explained what was going to happen before administering the shot to my knee. Dr. Yi is a wonderful doctor and knows how to talk with his patients. You can tell he really cares and listens to his patients. I was referred to Dr. Yi by another orthopaedic doctor due to the nature of my hamstring injury. I tore all 3 ligaments off the bone and they were tangled up near my knee. When we went to see Dr. Yi, he read the MRI and explained everything to us in detail. Michele, Dr. Yi’s administrative assistant, helped me get through everything before surgery and was there for me, not only as his assistant but as someone who really cared about you as a person. My surgery went extremely well and Dr. Yi was amazing through all of it. I was also able to meet Michele face to face and hug her. There are so many words to describe everything about my experience at Florida Orthopaedic Institute that I would run out of room with my testimony. SUPERIOR ALL THE WAY AROUND! Thank you all! Excellent surgeon! Great staff and follow up visits went well. I had little to no pain and the staff helped with any medical questions. I highly recommend Florida Orthopaedic Institute. I went to Dr. Yi for left hip pain. After I answered a few questions and had a manipulation exam, I was diagnosed with Bursitis in my hip joint. Dr. Yi gave me a shot in my hip and the soreness subsided almost immediately. He also provided comprehensive exercises to avoid a return of my pain. I am totally satisfied with his professional care and suggested treatment. Now, days later, my hip feels fine. Many thanks to Dr. Yi, I would highly recommend him. I tried other options for repairing my right knee, which had degenerated a great deal and was painful. I met with Dr. Yi after having an x-ray. We looked at it together and he suggested I have a full knee replacement. I had the surgery in November and I followed the exercise instructions. It was painful for a few weeks at the site. It is now February and I am practically back to normal- 90% improvement. I made a wise decision to have Dr. Yi do the surgery. He did an excellent job. Dr. Yi and the entire staff at Florida Orthopaedic Institute in Citrus Park is wonderful! Dr. Yi answered all of my questions and did a great job taking care of me! The entire staff was helpful, courteous, and professional. The facility is very impressive! It is clean and easy to get everything done in one place. I could see Dr. Yi for my appointment, get x-rays, MRI, as well as have my surgery in the same facility, all under one roof! Great place. I highly recommend Florida Orthopaedic Institute and Dr. Yi. They have many highly qualified Doctors on staff, I am sure you would be in good hands with any of them. My entire experience there was pleasant and successful! Thank you! Dr. Yi is caring and personable. He took his time and talked with me in order to truly understand my problem. He also did a thorough check of the area causing me pain and was able to recommend treatment options. I would go back to Dr. Yi anytime I ever need his expertise. Dr. Yi was excellent! He gave a clear diagnosis, answered all of my questions, and offered solutions to my knee issue. The staff members were efficient, fast, and extremely customer friendly. This was probably the best patient experience that I have ever had. I would recommend this place in a heartbeat. I am forty-two years old and a lifelong runner. Three years ago, I started experiencing pain in my right hip that I thought was a pulled muscle. I saw my primary care physician and he diagnosed me with just that and prescribed rest and stretching. After a year of following the doctor’s orders, the pain had still not gone away. I spent the next two years seeking opinions from other doctors, where I finally decided my running days were over, and I would live with the pain. Then, my urologist suggested I visit Florida Orthopaedic Institute where I made an appointment to see Dr. Yi. On my first visit, he viewed prior x-rays I had done, had another set taken, and within five minutes diagnosed me with FAI. He was very thorough in his explanation of exactly what was causing my pain and how it progressed over the past three years. He also explained my options for a surgical repair vs physical therapy. I opted for the surgery which I had done a few weeks later. I am now three months post-surgery and I can only say I wish I had visited Dr. Yi three years ago when my pain first started. The recovery was minimal and I am back to normal activities, including some light running, with no pain. I would recommend Florida Orthopaedic Institute and Dr. Yi to anyone in my situation. I really cannot speak highly enough of the care and expertise he provided, especially when I had decided there was no getting better. I had a complete tear of my hamstring. Dr. Yi at Florida Orthopaedic Institute came highly recommended for my orthopedic care by my primary care physician. Before and after surgery, Dr. Yi was thorough and explained all the details of my surgery to my husband and I. After surgery, I had little pain thanks to his surgical skill and excellent patient care. Michele, Dr. Yi’s administrative assistant, was a huge emotional help before and after surgery. She even answered my calls on the weekends! They truly went above and beyond the call of duty. The staff at Florida Orthopaedic Institute is phenomenal, outgoing, and caring. I would recommend this group to anyone who needs orthopedic services! This was my first visit to Florida Orthopaedic Institute. I was truly impressed with your nice facility, the caring staff, friendly “can do” attitudes and smiles. Dr. Yi and his front desk team were caring, smiling and laughing which provided a good atmosphere. Dr. Yi was very thorough and took time with me to answer all of my questions. I will without a doubt recommend Florida Orthopaedic Institute to my family and friends. Dr. Yi is an excellent surgeon. My surgery went well and I had little to no pain. I took Dr. Yi’s advice and got a CPM machine for the first three weeks. Follow up doctor visits went well and Dr. Yi really cares for his patients, remembers who you are and what procedure was done. I highly recommend him for surgery. I will be returning to him in the future to have my right hip taken care of. I play football, and when I dislocated my right arm in two places and severely injured my elbow, the team at Florida Orthopaedic Institute were really helpful. Dr. Yi was fantastic, and with their help, I was able to recover much faster than most people with my type of injury. This place is great at what they do! 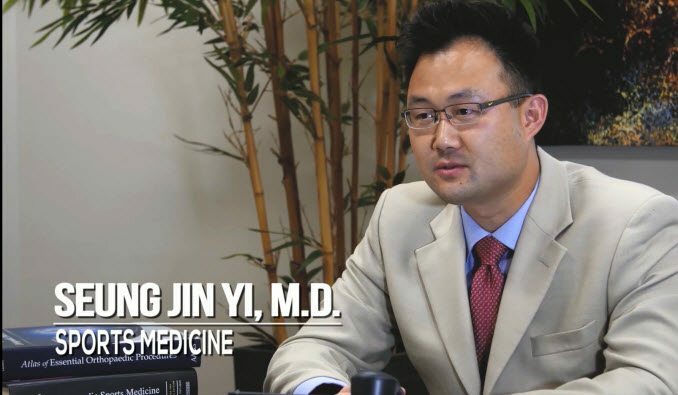 After experiencing issues with my knee for 3-4 years I finally decided to consult with Dr. Yi. I’d previously seen Dr. Epting for a minor foot issue and was very pleased with my experience. My consulting with Dr. Yi, testing to determine the likely cause of my problem, and the resulting arthroscopic surgery further enhanced my experience with Florida Orthopaedic Institute. Dr. Yi is knowledgeable and highly skilled in treating knee issues. If there is such a thing as a great surgical experience, this was it. I’ve had a few surgeries over the years and I can honestly say that my interactions with everyone at Florida Orthopaedic Institute has been the absolute best experience from the start. Dr Yi, his staff, everyone who made phone contact with me, the entire surgical staff… excellence personified. Everyone has been genuinely caring, helpful, professional, knowledgeable, nice. There were no glitches. A 100% positive experience. I highly recommend Dr. Yi and Florida Orthopaedic Institute for quality orthopedic care. My 93 year old mother fell and broke her left hip. Dr. Yi recently replaced it. Mom recovered very quickly with limited pain and spent only two weeks in her rehab facility at Brighten Gardens Assisted Living facility. She was back to living and moving as well after the operation as she had been before breaking her hip. Job well done! After I broke my shoulder, I was treated by Dr. Yi. I am very impressed with his knowledge, professionalism, empathy and warmth. He explained everything to me about my injury. The staff at Florida Orthopedic was very accommodating and everyone was so friendly and responsive. Dr. Yi s assistant, Erin, was very concerned about my pain and explained everything to me regarding my insurance. When there was a problem with my referral for physical therapy, Dr. Yi and Erin went above and beyond the call of duty. Dr. Yi called my primary care doctor to find out why I have not heard anything. I have never had a doctor do this for me before. Both Erin and Dr. Yi make a great team and both are very informative and helpful. I emphatically recommend Dr. Yi and his team of professionals to anyone needing orthopedic care.